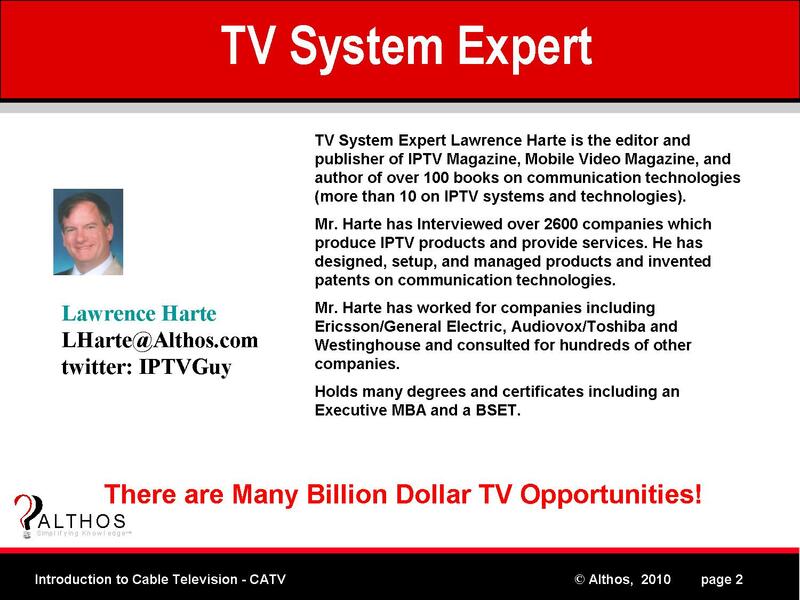 TV System Expert Lawrence Harte has setup, managed, and maintained voice, data, and video communication systems. He is the editor and publisher of IPTV Magazine, Mobile Video Magazine, and author of over 100 books on communication technologies (more than 20 on TV systems and technologies). Mr. Harte has Interviewed over 3100 companies which produce TV products and provide television services. He has designed, setup, and managed products and invented patents on communication technologies. He setup and is the group leader or TV Advertising Technologies group on Linkedin, runs the IPTV Magazine blog www.IPTV-Blog.net, and has been a speaker at many TV related trade shows including Telco TV, Telemanagement Forum, IEEE VTC, Internet Telephony, AHECTA (keynote speaker), and more than 10 other trade shows and seminars.